Educators of plant breeders in Africa met in Nairobi to develop new education and training materials for “Demand led plant variety design”. The educators from several African universities, regional and international organizations shared experiences across eastern, southern and West Africa on the content and organisation of current plant breeding courses and future needs. They benefited from the participation of plant breeders from the private sector who work in a market driven environment. The new educational materials will be based on demand-led R&D. They will be available for inclusion in post graduate programs in African universities. The course materials will also be available for continuing professional development of practicing plant breeders; and they will be made available on line for open and distance learning, thus extending the reach of the new knowledge Africa-wide. 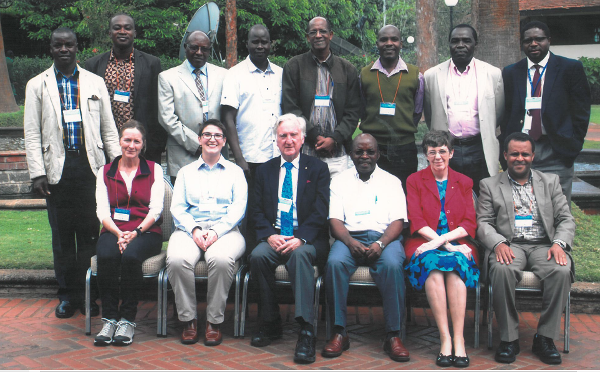 Crawford Fund Chief Executive, Denis Blight (pictured front row, 3rd from left below), attended the training and said, “This was an enlightening experience to see how African research leaders were prepared to build on their rural consultation and farmer participatory approach to take into account the interests of the broader food chain. Our aim is to build a curriculum consisting of a range of modules usable for postgraduate training and for professional development.